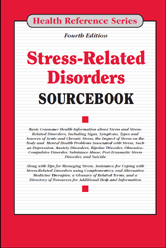 Stress-Related Disorders Sourcebook, 4th Edition, provides information about the origins and types of stress and describes physical and mental health disorders that may develop during and after stressful situations. Suggestions are included for managing aggressive driving, caregiver stress, occupational stress, and stress related to events such as economic hardship and return from active military duty. Chapter 1—Stress - An Overview. Chapter 15—Stress and Multiple Sclerosis. Chapter 31—PTSD among Military Personnel. Chapter 43—Stressful Situations: Tips for Coping.